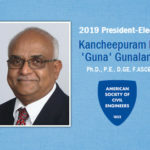 Kancheepuram “Guna” N. Gunalan will be ASCE’s 2019 President-Elect, elected by Society members in May and poised to be inaugurated in October at the Society’s annual membership meeting. A year later, he will become the Society’s 2020 President. “I’m humbled and honored by the opportunity I’ve been offered to serve the Society and the profession,” he said on learning he was elected. Gunalan, Ph.D., P.E., D.GE, F.ASCE, is vice president of alternative delivery at AECOM, based in Salt Lake City. Previously, he was a vice president for Parsons Brinckerhoff. Who is Guna, aside from his civil engineering achievements? 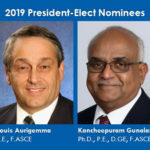 He shared some personal favorites in a Q&A with ASCE News. ASCE News: What is the quality you most admire in someone? ASCE News: What initially sparked your interest in civil engineering? Gunalan: Growing up, my parents were in the middle of building our family home in India. I spent time after school at the site where my mother would be supervising the day-to-day work. I got hooked on drawing plans, etc. ASCE News: What are you most proud of in your career? Gunalan: The folks I have mentored. ASCE News: At the end of a long day work day, how do you relax? Gunalan: Catch some news or shows on the tube. ASCE News: Favorite television show? Gunalan: M*A*S*H for an old show; The Big Bang Theory for a more recent one. ASCE News: What’s one thing ASCE members would be surprised to learn about you? Gunalan: I have a large record collection. When I first came to this country, I left a lot of things behind. I tried to build the record collection back up. Earth, Wind & Fire, The Police, a lot of stuff. ASCE News: Favorite sports team? Gunalan: Back in the 1980s and 1990s, the Los Angeles Lakers and the Dallas Cowboys. Now I root for whoever is the underdog. ASCE News: What is your favorite civil engineering landmark? ASCE News: What is one thing on your bucket list? ASCE News: Most used app? Gunalan: “One Call Away,” by Charlie Puth and “Can’t Stop the Feeling,” by Justin Timberlake. ASCE News: Go-to pizza topping? ASCE News: Are you a cat person or a dog person? ASCE News: Ideal vacation spot? Gunalan: In front of a body of water. ASCE News: Favorite Ben and Jerry’s ice cream flavor? ASCE News: When you were younger what did you want to be when you grew up? ASCE News: What is the most challenging project you have ever worked on? Gunalan: The new Tappan Zee Bridge in New York – Governor Mario Cuomo Bridge. ASCE News: If your life was a movie, who would narrate it? 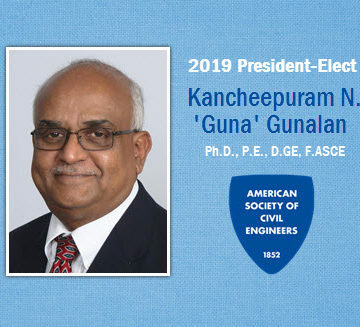 Read more in Gunalan’s own words about his professional background and aspirations as ASCE’s President-Elect. I’m proud to know that you are the 2019 President-Elect. Congratulations and Best wishes. I’m also civil engineer graduated from calicut university India , and later became US citizen. One question: why is that Most used app? = LinkedIn. ?